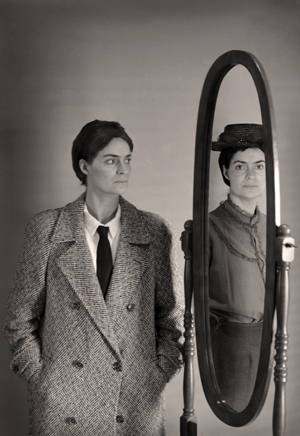 Amy Maud Bock was a New Zealand confidence trickster and male impersonator in the late 1800s/early 1900s. She was also the first child of Carolyn Bock’s great-grandfather Alfred. Using press articles and Amy’s own letters and transcripts, Bock attempts to bring this woman to life once more in this new work-in-development Habitual Criminal. All the actors – Martin Blum, Chris Bunworth, Helen Hopkins and Bock – were full of energy, displaying strong commitment to their roles. The myriad of characters they each portrayed – even if only for a few minutes – was done with much gusto, especially from Hopkins and Bunworth. I can see them having more fun with the roles as they develop this piece further and no longer require the script on stage with them, giving them the opportunity to use their hands and bodies more freely and to maintain eye contact with each other and the audience. The props and costumes, whilst kept to a minimum, did well in setting the scenes up and providing context to the story. The character changes that happened with the removal of a shawl or the putting on of a coat were creatively executed and never broke the flow of the story. Habitual Criminal was performed as part of La Mama’s Explorations season of works in various developments and in Bock’s own words, ‘this is the beginning’ of this production. It’s a very impressive and dynamic beginning too, however I feel the pace needed to slow down a little to allow for the audience to fully digest and comprehend what was happening on stage. I often found myself working hard to keep up with the actors and the material, and felt I lost quite a bit in trying to play catch-up. The story of Amy Maud Bock is quite unique and highly interesting – as my own research as inspired by this show has shown – so it would be a shame for any of this to be lost in translation and execution.